The creation of etudes is obligatory for every artist who dreams to improve his skill level. Drawing objects from nature is necessary in order to feel the object and to be able to convey its beauty, caught for one short moment. “Pine on the Rock” – one of many sketches created by the author. 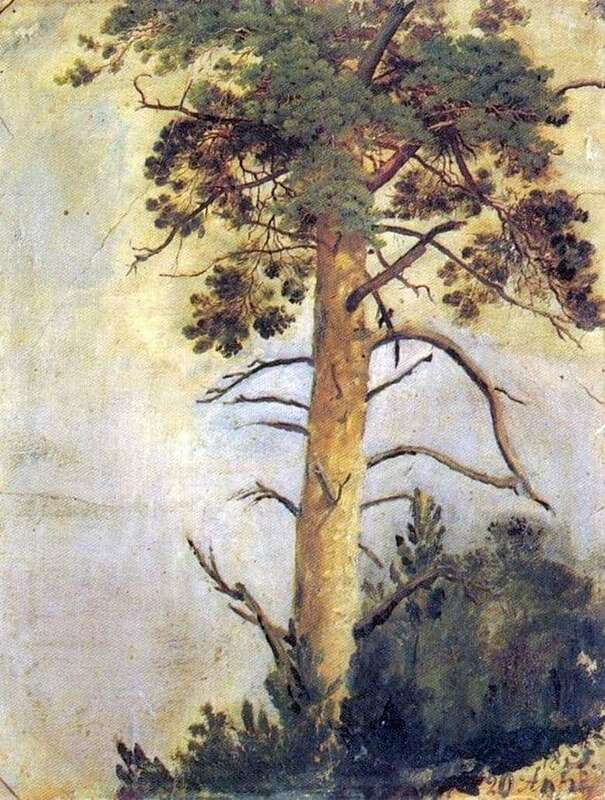 The main object of the picture is a large pine, painted with oil on ordinary cardboard. The branches of the tree are bent in different directions, the thin dark twigs at the top of the tree break and intertwine. Careful drawing of the branches is characteristic of the style of this artist, so the image looks so clear and realistic that it looks like a photo. The crown of the tree is depicted no less realistic, it is impossible not to pay attention to well-chosen colors. Closer to the sky, the foliage becomes lighter, and the lower part of the thick armfuls of sheets is darkened. Excellent mastery of the rules of light and shade allowed the artist to create three-dimensional, deep images that were full not only with external aesthetics, but also with the vividness of the painting. It seems that the light flows directly from the canvas, and the darkness makes the objects so deep that you can touch them just by stretching out your arm. The lower part of the image is partly filled with a bush, but the pine stands on a rarely overgrown flat surface – rock, impregnable and powerful. The background of the image is filled with yellow and white shading a beautiful tree. It becomes obvious that the day is bright and serene, and the branches of the pine are heated by the rays of the warm sun.